Primaluna Beach Hostel i Palomino, Colombia: Reservér nu! Primaluna is unique in that it appeals to backpackers on a budget as well as travellers looking for a bit more luxury during their stay. It offers a fun setting for young people looking to party but maintains a quiet atmosphere ideal for families with young children. It has a bar as well as a restaurant open from 7am to 10:30pm. The menu offers dishes that are a fusion between the Italian and the Colombian cuisine, a real pleasure for the taste (as homemade ravioli stuffed with robal, fresh tomato and shrimps or Mediterrean robal fillet with tomato sauce, black olives and parsley and many many more). The pride of the restaurant is the wood oven, ingredient of the crispy pizzas prepared at Primaluna’s. Musicians and artists from many different countries come to play their music and showcase their artwork. 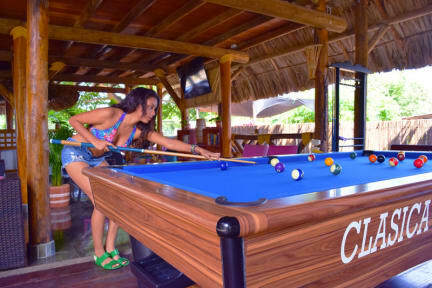 The staff is also able to arrange tours to popular local attractions like Cabo de la Vela/Punta Gallinas, Lost City, Indigenous Village, horseback riding, or tubing in the Palomino River. The bar offers happy hour on cocktails every day from 5pm-8pm as well as a karaoke night once a week. Facilities: Swimming Pool, Pizzeria with wooden oven, Restaurant, Bar, Shared kitchen available to all the guests, Wi-Fi internet connection, Pool table, Garden with palm trees and tropical plants,Basic Gym, Laundry service and Parking. 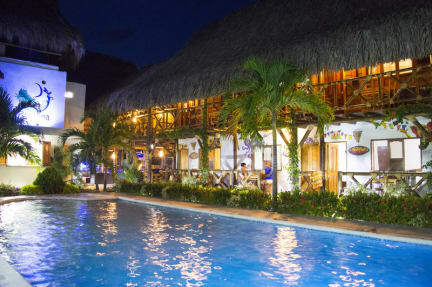 Primaluna Beach Hostel is located a few steps away from Palomino’a beach. The Carrera 6 is the main road to reach the sea from Palomino village. Palomino is located in the north of Colombia, close to the border between the Department of Magdalena and La Guajira, on the main coastal road connecting Cartagena to Venezuela. It is faced on the Caribbean Sea, at the foot of the Sierra Nevada of Santa Marta, whose majestic snowy peaks you can see from the village and the beach. It is located 70 km from Santa Marta and less than 70 km from Riohacha, the regional capital of Guajira. At Palomino you can relax on the beach waiting for the sunset with a cold beer in your hands or, for the most adventurous, it is possible tubing along the Rio Palomino which flows into the Caribbean, organizing excursions by bike or walking to the indigenous villages, or at the Tayrona Park and Ciudad Perdida (Lost City). Each of the private rooms has a bathroom with shower, a mosquito net, a wall-fan, a large terrace and is faced on the pool and the garden. There are two superior private rooms with air condition. Furthermore, there are 2 dorms for 6 persons and one for 8 people, each with their own private bathroom with shower, two wall-fans and a terrace. Each bed is equipped with mosquito net and a locker with electrical plug where and you can recharge in complete safety and autonomy. Check out from 7:00 to 11:00 . Payment upon arrival by cash, credit cards. (we charge the fisrt night the day before your arrivals). Reception available from 07:00 to 23:00.You have to pay an extra cost of the 5% if you pay with the credit card. You have to pay a deposit of 10.000 COP for the Key (just deposit) and for the towels (3.000 COP rent). Please note that there is an extra charge for debit and credit card payments. Great place, great location, great staff and great pizza.